29th October 2017 – In only the second marathon of her career, Vivian Cheruiyot (KEN) led from start to finish to take victory on a blustery day at the Frankfurt Marathon. Trying to learn from her first marathon in London, the aim was to pass halfway in 70 minutes and then attack the course record of 2:21:01 in the second half. The assisting pacemakers did a good job as the half was reached in 70:07 but in the second half the exposed areas of the course where the wind was at its strongest began to take its toll and the record pace slipped away. 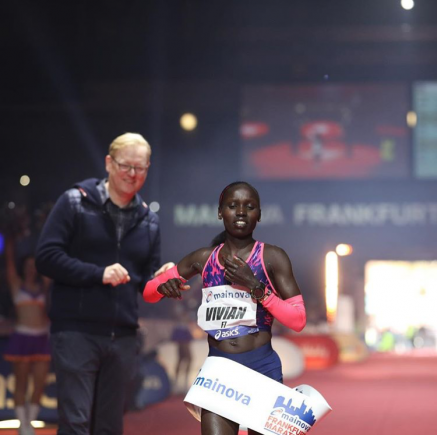 Despite this Vivian stick to her task as best she could and strode into the famous Festhalle finishing straight to cross the line in 2:23:35. Admittedly not the time she was looking for but still a PB, a first marathon victory and more experienced gained.